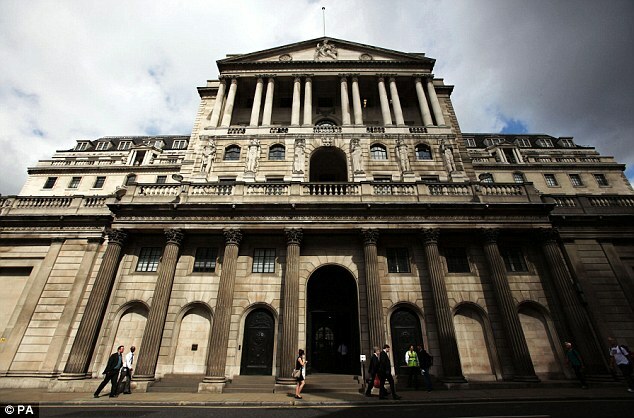 Strength in the domestic banking sector helped underpin gains by the FTSE around mid-session as the Bank of England once again left UK interest rates unchanged at record lows of 0.5 per cent, where they have been for nearly five years. The FTSE 100 index was up 12.7 points at 6,734.5 at lunchtime supported by the BoE’s latest pronouncements, although the policy decision was as expected. The Bank’s Monetary Policy Committee also maintained its economic stimulus package, even though a continuing improvement in economic data shows the British economy is improving well from the ravages of the 2008 financial crisis. The banking sector extended recent gains, encouraged by recent data showing lending improving to individuals and companies, and by the signs of strength in the British economy. Barclays was the best sector performer, up 5.3p at 288.9p, with part-nationalised lenders Lloyds Banking Group and RBS ahead 1.2p at 85.0p and 5.8p at 363.7p respectively. But emerging markets-focused lender Standard Chartered missed out on the sector enthusiasm, losing 55p at 1,257p after it announced the departure of its finance chief Richard Meddings and a wider shake-up including the integration of its wholesale and consumer banking arms. It was a mixed picture in the retail sector as well. Marks & Spencer provided support for the blue chips as a positive performance at its foods business lifted the stock, bucking a trend of otherwise gloomy Christmas updates in the retail sector. Shares in M&S topped the FTSE 100 leader board, up 11.7p to 456.6p after the retailer reported organic growth in food sales in the Christmas quarter, offsetting a weak show for its clothes business, which reported a 10th consecutive quarter of falling sales. The stock, which is still down 12 per cent from a five-year high hit in September, outperformed steep share price falls at larger food retailers Tesco and William Morrison, which reported like-for-like quarterly sales drops today. Tesco shares shed 3.6p at 324.7p and Morrison’s lost 18.3p at 235.3p. Adding to the sentiment for M&S, Investec Securities was prompted to upgrade its rating for the stock to ‘buy’ from ‘hold’. ‘The trend in the food market is being very much towards the top-end and value-end outperforming the big four, and certainly the results over Christmas have confirmed that trend is continuing,’ said Investec analyst Kate Calvert. The energy sector also provided support for the index as the oil price firmed, with Tullow Oil among top gainers after an upgrade in rating by HSBC. Tullow shares added 25.5p at 845.5p. Rivalling the food retailers among the top blue chip fallers was bookmaker William Hill, which shed 28.1p to 371.7p. It was downgraded to ‘equal weight’ from ‘overweight’ by Barclays after Britain’s parliament debated fixed odds betting terminals and did not rule out restricting them. ‘Regulatory change has always been the key driver of sentiment toward the gambling sector. Yesterday the Labour Party called for greater regulation of the gambling industry in the UK,’ analysts at Barclays said in a note. Mid-cap bookies Ladbrokes also fell, losing 7p to 172.7p with Barclays cutting its rating on the stock to ‘underweight’. The FTSE 100 has moved 20.5 points higher to 6,742.3 as investors spend another day scrutinising Christmas trading bulletins from Britain’s top High Street retailers. Shares in both Morrisons and Tesco slid after the supermarket groups posted disappointing figures. Morrisons suffered the biggest fall, down 6 per cent or 14.45p to 239.75p, after it said profits will be at the bottom end of the City’s current forecast range following a 5.6 per cent decline in like-for-like sales. Tesco disappointed City analysts with a 2.4 per cent decline in UK like-for-like sales for the Christmas period. Chief executive Philip Clarke blamed the fall on difficult grocery market conditions and insisted investment in the business continued to pay off. However, shares fell by 10.3p to 318p, a drop of 3 per cent. Read more here about Tesco and Morrisons, including City reaction. Marks & Spencer shares weathered the storm better despite reporting a 2.1 per cent decline in quarterly general merchandise sales, offset by an improvement in the run-up to Christmas when underlying sales rose 0.5 per cent. Having fluctuated ahead of the trading update, M&S shares were up 9.75p to 454.65p today. Read more here, including City views on whether M&S can turn around its business. Standard Chartered shares shed 48p to trade at 1,264p after it announced the departure of finance chief Richard Meddings and a wider shake-up including the integration of its wholesale and consumer banking arms. Sainsbury’s, which posted flat sales figures yesterday, was down 8.5p to 351.45p and Sports Direct International fell 7p to 746p. Bookmaker William Hill fell after a downbeat note on the sector from Barclays. Its shares slumped 24.65p to 375.15p, while FTSE 250 rival Ladbrokes was 11.1p lower at 168.6p. Anita Paluch of Varengold Bank said: ‘Markets have shrugged off sluggish performance, moving into positive territory as traders await two central banks’ decisions – both the Bank of England and European Central Bank are not expected to change anything in their respective interest rates. ‘What is interesting though is what ECB has to say on the subject of its policy in the context of easing inflation and very sluggish recovery in the region. ‘Low inflation not only means growth is very anemic, but also poses problems for governments with heavy debt loads. 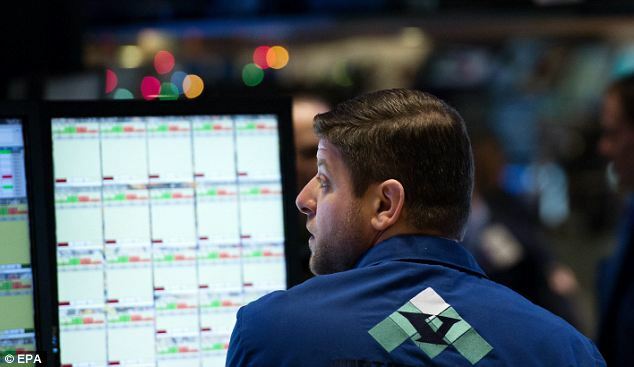 The FTSE 100 is forecast to open slightly higher, but investors are expected to stick to the sidelines ahead of decisions by the European Central Bank and the Bank of England later. Both central banks are likely to keep interest rates on hold today, but the ECB might remind markets its policy could ease further if inflation stays too low or money market conditions tighten. Investors will also be reluctant to place strong trading bets before tomorrow’s monthly US jobs report, which could go some way to determining how quickly the Federal Reserve reduces stimulus measures that helped equities to hit new highs last year. Minutes of the US Fed’s meeting on December 17-18, released after the European market close yesterday, showed many members of its policy-setting committee wanted to proceed with caution in trimming the stimulus. The Footsie closed down 33.67 points at 6,716.16 yesterday, with retailer J Sainsbury falling after issuing a cautious outlook statement and tobacco stocks lower on concerns over regulation in China. TESCO: The world’s third biggest retailer posted another heavy drop in underlying sales in its main UK market in the Christmas trading period. The figures came in towards the bottom of analysts’ range of forecasts and added to pressure on management to end a run of poor results. MARKS AND SPENCER: The firm’s much vaunted new ranges failed to prevent its clothing sales falling for a tenth consecutive quarter, although the firm avoided a formal profit warning thanks to a solid performance by its food arm. However, the firm did cut its UK gross profit margin guidance for the full 2013-14 year to level from previous guidance of a rise of 0.3 to 0.5 percentage points. WM MORRISON: The grocer posted a sharp fall in like-for-like sales over Christmas, blaming the ‘disappointing’ performance on difficult market conditions, heavy discounting by rivals and the lack of a full online offer. It now expects full-year underlying profit to be towards the bottom of the range of current market expectations. RSA: The insurer said a review of its businesses by accountants PwC concluded accounting irregularities at the company were confined to its Irish business and did not amount to a group-wide problem. ROYAL BANK OF SCOTLAND: The new head of RBS is preparing to take another axe to the lender’s cost-base in a move which could herald thousands more job cuts, Sky reported. ROLLS ROYCE: Finland’s Wartsila confirmed Rolls had approached it with a preliminary proposal for an offer, but the discussions had ended. GREGGS: The baker said it returned to sales growth in the fourth quarter, helped by strong trading in the Christmas period and putting it on track to post annual results in line with its expectations. HAYS: The recruiting firm said net fees rose 3 per cent in the second quarter, with permanent job placements growing faster than temporary ones for the first time in two and a half years. We all know what The BOE decision will be.Waste of time and money in having the meeting really. There shouldnt be a floating market, everything should be fixed and controlled by the central government. I can guarantee there would be no financial crisis. Is cuba in crisis? No cuba spent over half a century flat broke and in ruin, only now is it starting to let some capitalism in.